55# MAGGY LONDON. length 35". bust 18"x2. Excellent condition, smoke free. Total length 44". Really beautiful dress. The picture does not do it justice. Pit to Pit 20 ". Material Polyester,Rayon,Spandex. Color Grey,Black,Beige. Discover daily new arrivals in all seasons, sizes and styles that you can't find anywhere else. Type Dress. All details of the product have been included. Material Polyester,Spandex. Type Dress. Discover daily new arrivals in all seasons, sizes and styles that you can't find anywhere else. Color Red,Red. All details of the product have been included. Item Details. Good condition dress. Bell full length sleeves. Condition is Pre-owned Excellent with no Flaws. Washed and Ready to Wear. Length - 49". Pit to Pit - 18". Elastic ruched waist. waist elastic. 5% spandex. This dress is in excellent preowned condition. Your style will be in full bloom in this Maggy London dress. Keyhole cutout at front of round neckline. Three quarter sleeves with cold shoulders. Dual hand pockets. Concealed zipper closure at back. When laying flat arm pit to arm pit = 14 in. Arm hole = 6 in. Length = 44 in. Maggy London Dress 10P Eyelet Navy Hot Pink Fit & Flare Lined Short Sleeveless New with tags Approximate measurements Chest armpit to armpit 18" Waist flat across 15.5" Length 35" Returns accepted within 30 days. Discover daily new arrivals in all seasons, sizes and styles that you can't find anywhere else. Type Dress. Color Purple. All details of the product have been included. Material Polyester,Spandex. Item Details. Women's Maggy London size 4 summer dress (sleeveless) in floral design. Pristine condition. Only worn once for a special occasion. Maggy London brand summer dress with a multi-colored floral design accented with a turquoise and gold chain pattern. 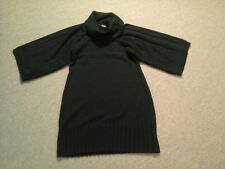 Size 4 R (not petite), sleeveless with modest neckline but v-shaped back. Classy but fun to wear because it screams -- "Summer is here". By Maggy London; made in the USA and imported. A finely ribbed skirt and cuffs streamline the blouson silhouette of a wool-blend, bateau neckline sweater-dress for an effortlessly chic finish. length from shoulder to hem: 38". • Length: 37”. • Waist (laying flat):15”. Such a pretty V-Neck, stretchy, sleeveless, fit and flare dress in size 10. waist 13" double that (stretchy). Maggy London Ruffle One Shoulder Stretch Satin Sheath Dress. An elegant sheath is defined by a fluid ruffle that travels across the one-shoulder bodice and fashions the single flutter sleeve. Ruching at the side provides for a more flattering fit. Cute sundress. Fun colors. Perfect condition. Material Polyester,Spandex. Type Dress. Discover daily new arrivals in all seasons, sizes and styles that you can't find anywhere else. Color Green. All details of the product have been included. Item Details. This sleeveless Maggy London dress is in great condition. It is free of fading, stains, tears, and snags. It is made of 93% polyester, 7% spandex and is marked as a size 14. Your happiness is my success! Great condition. Dress has a belt and pockets!